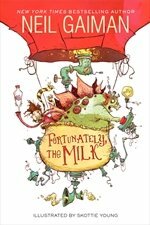 Hilary Taber tells us about Neil Gaiman’s newest book, Fortunately, the Milk with illustrations by Skottie Young, (Harper Collins Children’s Books, $14.99, Ages 8-12). Click here for Mouse Circus, the official Neil Gaiman Website for Young Readers. “We have come to your planet from a world very far away,” said the people in the disc. I call them people, but they were a bit green and rather globby and they looked very grumpy indeed. “I jolly well won’t,” I said. One day two children are left alone with their father for the weekend. Their mother is gone on a business trip. The last thing their Mum told their Dad was, “Oh, and we’re almost out of milk. You’ll need to pick some up.” Time passes and suddenly the brother and sister duo inform their Dad that there is no milk for their “Toastios”. After waiting for Dad to come back with the milk, “For ages…” he finally returns with the milk and a tale to tell. This is a tale of high adventure involving aliens, pirates, a Professor Stegosaurus who pilots a floating balloon/time machine, and all of these combined together make for the perfect blend of humor, imagination, and two skeptical children who wonder if Dad is just making it all up. Maybe he is, and maybe he isn’t. 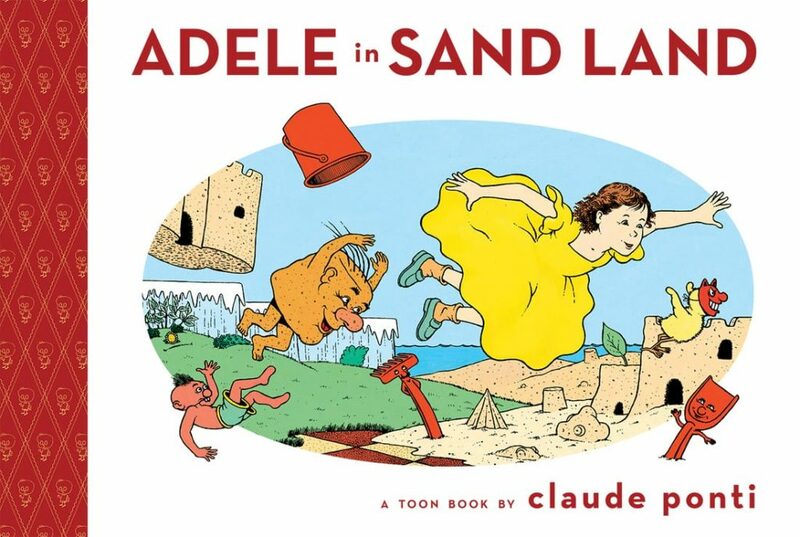 You will have to read this wonderful book yourself to find out! Click here for Neil Gaiman’s blog. Rod Serling’s Twilight Zone’s enduring legacy has been the impact it’s had on short form storytelling and the generation-spanning celebration of the paranormal-infused science fiction/fantasy genre. But, alas, for the demographic born after 1990, television has failed to deliver the next culture-defining anthology program. Perhaps with Explorer: The Mystery Boxes ($10.95 paperback, $19.95 hardcover, Amulet Books, ages 9 and up), as edited by Amulet creator Kazu Kibuishi, with stories by a host of other artists and writers, the graphic novel format will carry the torch of those well-told– often replete with jaw-dropping, gut-punching finales– morality plays that possess more than a touch of the bizarre. Explorer holds seven short tales, including one by Kibuishi himself, connected thematically by one element: each work has its own manifestation of a magical, mystical, or otherwise pedestrian-seeming box. The boxes, whether harboring treasure or inciting mischief, are really the crystal pools in which the true nature of the protagonists are reflected. The seven stories vary in tone and atmosphere, from the comic to the otherworldly, and, as is wont with anthology compendiums, they achieve varying levels of success. Chief among the standouts are Emily Carroll’s “Under the Floorboards”; in it, a young girl discovers a duty-bound wax doll that may be evolving (or devolving) into a spiteful doppelgänger. Carroll’s grim fairy tale plays out like a minimalist hybrid of the gothic whimsy of Cartoon Network’s Adventure Time series and the psychological interior of Marjane Satrapi’s award-winning graphic novel Persepolis. It’s also the closest in spirit to Serling’s odes to the macabre. Rad Sechrist’s “The Butter Thief” adopts an outline-free aesthetic reminiscent of Genndy Tartakovsky’s elegant Samurai Jack animated series, and is the most action-packed and oddly moving of the bunch. The scope and spiritual ambition of the Explorer: The Mystery Boxes compilation is admirable– the mystery is why it isn’t attempted more often. To learn more about Jason, please visit About Our Reviewers page by clicking here. In Adventures With Kazmir The Flying Camel: The Five Skies by Gina L. Vivona, readers will find enough amazing exploits to keep them turning the 121 pages and will be sad to say good-bye to the well-developed characters at the story’s end. And while I do not usually review self-published titles, I am so glad I agreed to read Vivona’s book because it was so original, entertaining and imaginative. Don’t forget, too, to visit the fabulous website with a sample chapter, fun stuff to do, a parent’s page and more! If you purchase the audiobook you will also be treated to a narration by three-time Emmy Award-winner Bryan Cranston along with wonderful, mood-setting music that will transport you instantaneously to a magical land where anything can happen. The Mostly True Story of Jack ($16.95, Little, Brown and Company, Middle Grade) is by Kelly Barnhill and reviewed by Lindy Michaels. Who is Jack and perhaps more importantly, what is Jack? He is taken by his divorcing mother to stay with his aunt and uncle in the town of Hazelwood, Iowa. Even though Jack had always felt invisible to his mother, he never wanted to leave her. But oddly, there was something so familiar about this new and strange place, although he knew not what. And the strange only got stranger to the boy, as the days went by. Jack knew things, remembered things, but he just couldn’t seem to remember why he was remembering these things and what they meant. It was all so fuzzy in his mind. There was the ancient book that his uncle gave him, which was filled with magical and unworldly information. Very confusing! There was the girl, Wendy, who knew things, but wouldn’t tell. And there was her twin brother, Frankie, who years before, mysteriously had disappeared for months, only to be found by Jack’s uncle, his face now scarred, unable to utter a single word, never able to tell what had happened to him and why. The richest man in town, Mr. Avery knew the secrets of Hazelwood, of the Lady under the ground, who had split in two… her good side weakened by her evil side, who stole the souls of those who had disappeared from the town. And yes, there were many of them. And the strangest thing of all was that once they were gone, they were immediately forgotten by their loved ones, by the town. It was as if they had never existed. And later, Wendy was underground. Would she be forgotten forever? Could her soul be saved? What was the secret of this town and the Lady, split in two? And who would win? The good side of her, or the evil? And somehow could the young boy, Jack, have the magic within himself to find the answers? To save Wendy? To rescue all the taken souls? To bring together the good and evil of the Lady and make her whole, once again, perhaps making Jack whole again, too, to finally find his way home? The Mostly True Story of Jack is a mesmerizing read, beautifully poetic, with the rhythm of the wind. This is a novel that compels one to turn page after page, because one must learn of all the secrets and haunting mystery and magic of Hazelwood. Written so beautifully by first time children’s author, Kelly Barnhill, this story will take readers to places they could have never, ever imagined in their wildest dreams. My personal opinion is, because of the rather complicated storyline, I recommend it for children ages eleven up through adulthood, all of whom, I believe, will be as touched by this magical journey as I was. A stunning debut novel.